The summer heat can bring on the budget blues when it starts to reflect on your electrical bill. The best way to keep your costs down and your home comfortable is to stay on top of bi-annual HVAC maintenance. Doing so helps your unit last longer and provides you with greater energy efficiency, reducing its cost of operation. 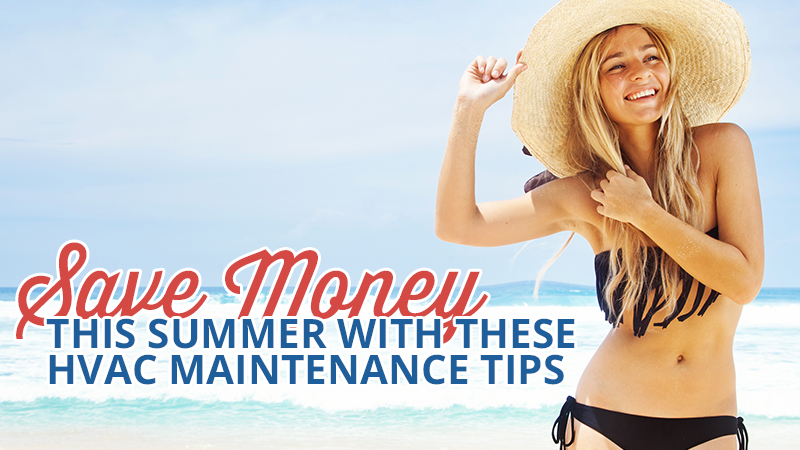 Here is a list of maintenance tasks you should perform this summer to save energy and save some money. Tackling this maintenance task alone can reduce energy use by as much as 15 percent. It’s recommended that you replace your air filter monthly during the summer. Replacing your thermostat to a programmable one allows you to take advantage of the times when the house can stand to be warmer, such as when it’s empty or at night, in order to be more efficient. Invest in a smart thermostat that you can communicate with via a cellphone app so you can cool your house ahead of your early arrival. Keep any heat-producing appliances away from the thermostat, including TVs and lamps. Speaking of thermostats, set the temperature to your comfort zone and no lower. Contrary to popular belief, a lower setting will not cool your home any faster. If you live in a place that gets cold at night, take advantage the chilled air by opening windows in the evening to ventilate the home. Remember to close windows when you wake up to seal in the cooler air accumulated overnight. Closed air vents don’t allow cool air to circulate properly. Make sure all vents are open and not blocked by any furniture. While you’re at it, look for improperly sealed windows, doors and other cracks in your home and seal them. Ceiling fans used in conjunction with AC allow you to comfortably raise the temperature setting, but they only help when a room is occupied. Remember to turn them off when you leave the room. The installation of an attic fan can further help improve the efficiency of your AC by blowing away all the rising hot air the accumulates and gets trapped near your ceiling. Ensure that your outdoor HVAC unit stays free and clear of any debris. Pull away any brush, rake up leaves and pull up any weeds within a two-foot radius of your unit so it can draw air efficiently. Appliances age, and HVAC systems are not immune. Upgrading an older AC to a modern high-efficiency air conditioner can reduce your energy use by as much as 50 percent. Look for ENERGY STAR-qualified units with a SEER rating of 13 or higher to ensure you get the best efficiency. A trained technician should do an in-depth checkup and annual maintenance of your AC unit. While there, a Metro Comfort Systems tech can clear out the drain, check for worn down parts, and clean the internal fan blades to prevent dust and grime buildup. Hiring a professional saves you money by ensuring peak efficiency and catching problems before they damage your unit. Is your unit due for maintenance? Call Metro Comfort Systems today to schedule an HVAC check-up.